Stationary bikes burn approximately 400 calories per hour. The American College of Sports Medicine recommends 150 minutes of moderate-intensity cardiovascular activity per week, making it a large part of any workout program. Swimming, biking, walking and jogging are just a few of the many options for aerobic exercise. 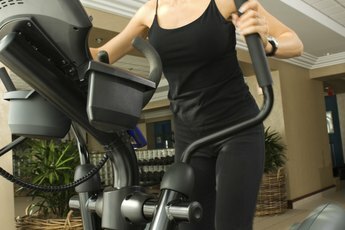 When comparing stationary bikes, treadmills and step masters, the differences help you decide which is most appropriate. All cardiovascular exercise burns calories, but some types burn at a faster rate than others. When comparing a treadmill to other types of equipment you must consider how fast you're moving. For a 140-pound woman, ACSM says that walking 4 miles per hour burns approximately 315 calories in one hour, while the same woman running 6 miles per hour would burn about 635 calories. Compare that to a stationary bike, which burns 254 calories in one hour and a step master that burns 508 calories, according to ACSM. Generally speaking, you can expect to burn more calories on equipment where you stand up and have to move your entire body. The more muscle you engage, the more calories you burn. Impact on bones and joints during exercise can be a positive and a negative. On the negative side, high impact activities can be very hard on joints, particularly if you have a pre-existing injury or arthritis. On the other hand, one positive effect of higher-impact exercise is increased bone density. Walking or running on a treadmill is considered a weight-bearing exercise because you need to lift your entire body weight and land on it each time you step. Weight-bearing exercise is known to build bone density and strength, an added benefit for women who tend to lose bone density as they age. 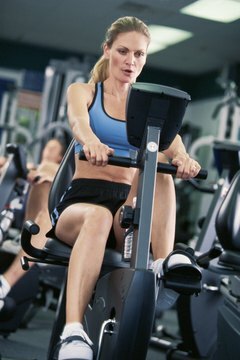 Stationary bikes are considered non-impact because your body weight is supported by the seat: They do not offer the bone building benefits that a treadmill does. A step machine falls between the treadmill and the bike for impact and bone building benefits. If you are considering purchasing a piece of home exercise equipment, take the size and weight of the machine into account. A treadmill should have at least six feet of open space behind it to reduce the risk of injury if you fall. Step masters have a smaller footprint on the floor than a treadmill, but your ceiling may not be tall enough to fit the machine with you standing on it. Stationary bikes require the least amount of space, and some models also fold together to further minimize the space requirements. Maintenance is an important factor to consider when comparing different types of exercise equipment. All types of equipment need to be cleaned regularly and monitored for wear and tear, especially moving parts, such as treadmill belts and stationary bike pedals. Check with the manufacturer to determine what other types of maintenance and repairs are common and what type of warranty is included. Always consult with your physician before starting any exercise program.